Another part of my series of articles about my socially embarrassing situations. Read part 1 and part 2. Me and my sister love to sing together, it’s our favorite thing to do on weekends. The problem is that I love singing too much. Sometimes I get an uncontrollable urge to sing. And the worst thing is when that happens in a public place. In such case I have no choice but to repress this urge as much as I can. But sometimes I‘m walking on a street when I feel a strong desire to sing. The street looks empty, no one is around. So I take a risk and start singing. Usually I don‘t get caught, but it happened to me a few times that out of nowhere, a person appeared a few meters from me. It‘s like they literally manifested out of nowhere, and of course, they‘ve heard me singing. In this situations I feel extremely uncomfortable. As much as I‘m okay when my family hears me singing, when a stranger hears me singing, I feel like I want to disappear out of this world. I just walk away and act like nothing happened. One time an awkward moment happened when I was casually having my concert while home alone. I sang my favorite songs REALLY LOUDLY. Suddenly the door bell rang and I went to open the door. It was a postwoman. She had this weird grin on her face while she was giving me my letters. As she was leaving, she told me that I have a nice voice and I should audition for X-Factor. Till this day I have no idea if she really meant it or it was supposed to be sarcasm… But I felt really awkward afterwards. I should have realized that the whole street could hear me when I was singing. One thing I hate is doing presentations in front of people. Sadly you can‘t avoid them while you’re in school. 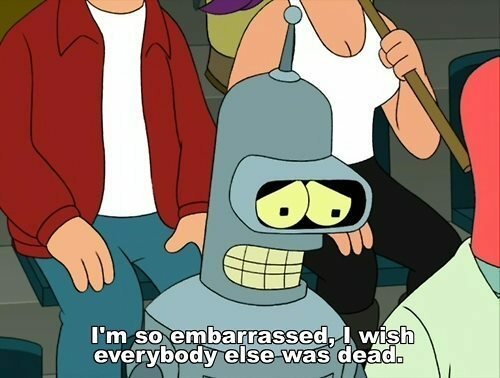 I‘m always extremely awkward when I speak in public. I tend to have nervous tics, I stutter, I mumble words which make no sense or forget everything that I‘ve learned. The longer I was standing here trying to remember something and save this awkward situation, the worse I was feeling. And the more I needed to go to the bathroom… I‘ve literally felt like I was going to vomit in front of everyone. So what did I do? I did what I know best: I ran away. I‘ll admit it. My thoughts are really weird. If someone could see what is happening in my head, they would think I‘m psycho. I do remember once, a long time ago, I was in class and I was staring really hard at this pencil. I never know how to handle eye contact… I tend to swing between two extremes. In social situations involving conversations, either my gaze is lost in space, fixed on some random point while nonetheless listening to whoever’s talking (at least for the first five seconds if it’s something I’m supposed to be listening to, less if I don’t care, and more if I do, but yeah, I inevitably drift off), or, I look directly into their eyes, which does take conscious effort. This means I don’t blink for a prolonged period of time, and the look I give, as it’s been described to me by others, suggests either that I’m planning to kill them or that I’m ripping their mind or soul open (or something to that effect)…I had a staring contest with a friend, she ended up freaking out a bit and continuously asking me to please blink. My reply: “Hold on, I’m pushing for a new personal record.” It appears hostile, in any case, and yet I don’t mean it. 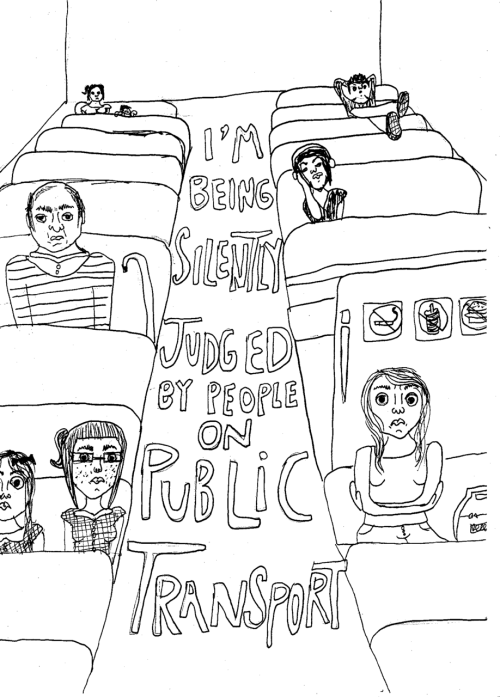 But I do tend to avoid eye contact with strangers, sometimes even acquaintances, or pretend I didn’t see them. Another weird thing that I do a lot is that I make corresponding facial expression to my inner conversations. It happens to me all the time. Walking on a street, sitting in a bus, in a classroom… I‘m having an interesting conversation with myself in my own head and I don’t realize that the emotions I feel so deeply inside are evident on my face. This makes other people think I’m completely insane. The thing I struggled probably the most with during my time in school was solving math problems in front of the entire class. Don‘t get me wrong, I‘m not stupid and math wasn‘t a big problem for me. The problem I have is that when I am called to perform in front of people, I suddenly forget everything I know, even my own name. If you asked me how much is 2+2, I would probably just look at you with a stupid gaze on my face and the answer wouldn‘t hit me. That‘s how bad it is. I‘ve had a panic attack every single time a teacher called me to solve a math problem in front of a blackboard. It always resulted in public humiliation. The weird thing about it was that the teacher knew that I wasn‘t stupid and math really isn‘t the problem. I used to get best grades in tests. But in front of a whole class I acted like I was retarded. After a few failed attempts, the teacher realized that I probably won‘t get better at it. So the funny thing was that each member of the class solved something on the blackboard and the only person who always got left out was me. Person: Oh my god, I love your dress! The color really suits you! Me: I have no more compliments left! I honestly did like the dress. 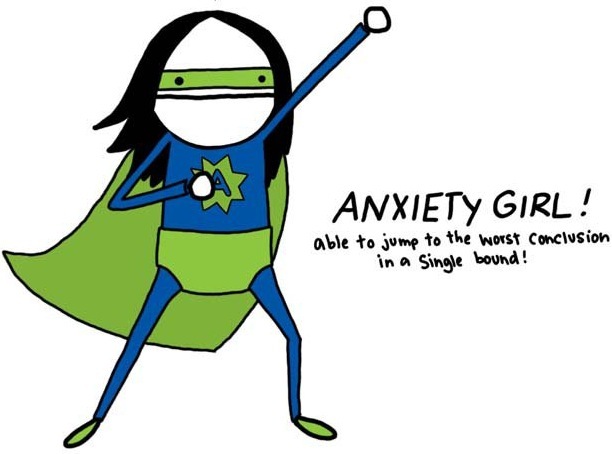 Social anxiety is the term used to describe a high level of shyness. Of course everyone feels shy or anxious in certain social situations, but for some people it can be a little more extreme. When this is the case it has a huge affect on their lives and stops them doing the things they would like to. For example it may affect their confidence to go to school or work and impact on their confidence to make friends and enjoy their hobbies. When in such situations, people can often experience many uncomfortable physical symptoms of anxiety. They often worry that others will notice these symptoms and judge them negatively as a result. Socially anxious people often feel under the spotlight and believe that everyone is thinking badly of them. They often hold beliefs that they are no good socially, are boring, and that they have nothing interesting to contribute. After social events, they tend to pick out parts that they believe went poorly and beat themselves up over them. 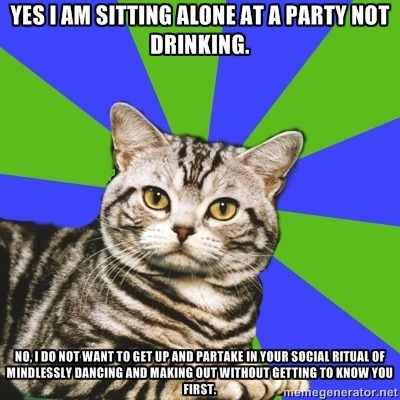 To cope with social anxiety, people tend to avoid social situations if possible (parties, pubs, canteens…). If they can’t avoid them, they tend to try and stay in the background and attract as little attention to themselves as possible (say very little). Do you feel anxious or self conscious during social situations (parties; eating in public; or one to one conversations)? Do you find it hard to participate in the things you want to because of your shyness? Do you tend to avoid speaking to people when you can? Do you worry that people think badly of you in social settings? Do you worry that you have nothing interesting to contribute to conversations? Do you worry that you are the center of attention and everyone can see how anxious you are? If the answer to any of these questions is ‘yes,’ you may be experiencing symptoms of social anxiety and you may find my future article on how to overcome social anxiety helpful. Anxiety is one of those things that a LOT of people have, but nobody seems to know what causes it. Anxiety is defined as: A feeling of worry, nervousness, or unease, typically about an imminent event or something with an uncertain outcome. I think we’ve all had an experience like this before. Whether it’s been in our relationships, in school, at work, or friends, wouldn’t you agree? So, the moral of this story and article is that… it’s okay to admit that you get anxious, nervous, frustrated, stressed. Regardless if you have really intense panic attacks and you’ve been going to doctors and psychologists for years, or if you just have frustrating and stressful days at work sometimes, maybe you hate doing homework! There’s nothing wrong with you. For most people, they see something like that and say “Yeah, stress, the environment, that’s why I have anxiety… Okay, I guess that’s it then”. That answer is satisfactory. I’d like to take it a few steps deeper. This page says anxiety is “caused by environmental factors”…. what factors exactly would that be? It says that it’s “most commonly triggered by the stress in our lives”. Why do we have the stress in the first place? What are we doing collectively as a species that most people have anxiety? What are we doing that’s created anxiety to be the most common mental illness? This is unnatural. Can you see another species in nature where almost half of the species is “mentally ill”? It’s actually pretty simple. As a species, we’ve created a perceived separation between all of us. When we feel separate, isolated, and without anyone to back us up or give us love, we have panic attacks, anxiety, depression, all of it! There are now millions of people who are feeling this way, completely alone in the world, as if everyone around them is an enemy. When everyone is your enemy, and you have no-one in your life to comfort you when your feeling down… and maybe you don’t even have anyone you can comfort, it’s very easy to feel alone and depressed. The good news is, there is something you can do about it. It’s something we can all do. When we begin to create more intimate, real, and powerful connections with each other, we can begin to feel safe again around other people, and step back into who we really are. The return to innocence that we once were when we were born. You can truly be, do, or have anything you want. There are those of us who have incarnated here on Earth, who carry a certain frequency. This frequency has such strength that it generates a response within those who are exposed to it that brings about a shift of awareness and thus a large change. Some aren’t ready for this change, some aren’t ready for this awareness of themselves and so they close off, resort to child-like behaviour or even go on the offensive and get outwardly destructive. And some, who are ready, flock to this vibration like a moth to a flame knowing, on a molecular level and deeper, that exposure to this sort of frequency will mean the shedding of the old and the experience of new.